A popular fruit beer from Titanic Brewery has been named as one of the Champion Beers of Britain. Plum Porter was awarded the Gold Medal in the Speciality beers category in the Champion Beer of Britain competition at the 2015 Great British Beer Festival (GBBF). Breweries from across the UK compete in the competition at GBBF – the most prestigious and popular annual event for British beer lovers. 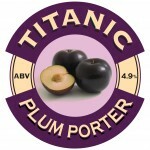 Titanic Brewery, of Burslem, Stoke-on-Trent, has seen Plum Porter grow into a hugely popular drink following its launch in 2011. “There will be plenty of people raising a glass to the success of Plum Porter in our own pubs and others across the country,” said Titanic Brewery Director Dave Bott. “It has won awards at regional beer festivals and has become one of our best selling beers. With an ABV of 4.9 per cent, Plum Porter is a strong, dark ale in which you can readily taste the fruit. It has previously won awards at CAMRA beer festivals in the East and West Midlands and Cheshire and is Plum Porter is available all year round in pubs serving Titanic Brewery beers as well as featuring in the brewery’s bottled range. The five-day GBBF, organised by the Campaign for Real Ale, is estimated to attract over 55,000 visitors to London’s prestigious Olympia exhibition centre. More than 900 beers are available at the event. For further information about Titanic Brewery and its award winning beers visit the company’s website at www.titanicbrewery.co.uk Titanic Brewery was founded in Burslem in 1985 and has grown to produce around three million pints of fine ale every year. It is owned by Stafford born brothers Keith and Dave Bott. Keith is Chairman of SIBA, the society of independent brewers. The brewery name is in recognition of Stoke-on-Trent as the birthplace of Captain Edward Smith, Master of the ill-fated Titanic ocean liner.